1st-Apr-2014 02:15 am - All aboard! So, in short: Does it work? It does, no problems so far. With proper CD Audio support and all that . Will I be selling it? Probably not because it's hand made and bloody expensive. Then again, I could use some extra money so a limited run is possible. 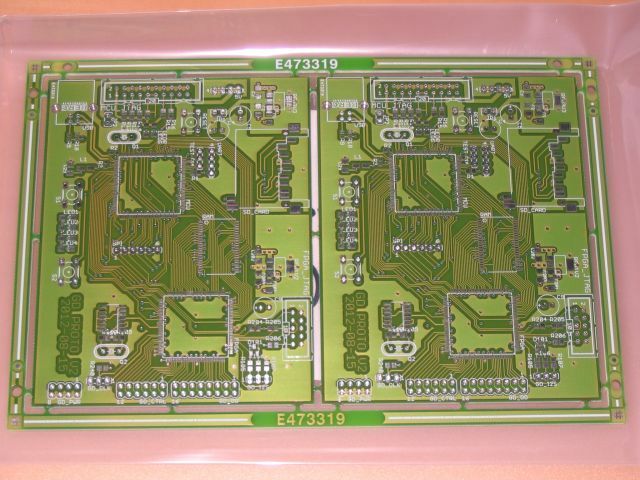 Also, sorry for not responding to comments and private messages but since I've first shown GDEMU PCBs I've been spammed with tons of stupid questions. I have neither time nor patience to answer those, so basically I now ignore the inbox. 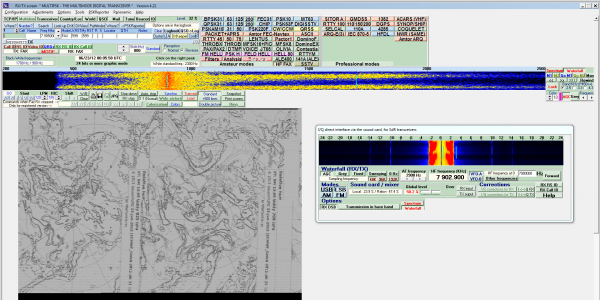 The first one was taken on system with Catalyst 13.1 WHQL and the second one on 13.2 beta. Day wasted on fixing this particular "bug". And before someone points out "This is what you get for using beta drivers" - there is a reason I need to be on 13.2 or newer. Dave Murphy from devkitPro.org is trying to raise some money for his project. Please go visit this web page and see if you can help. 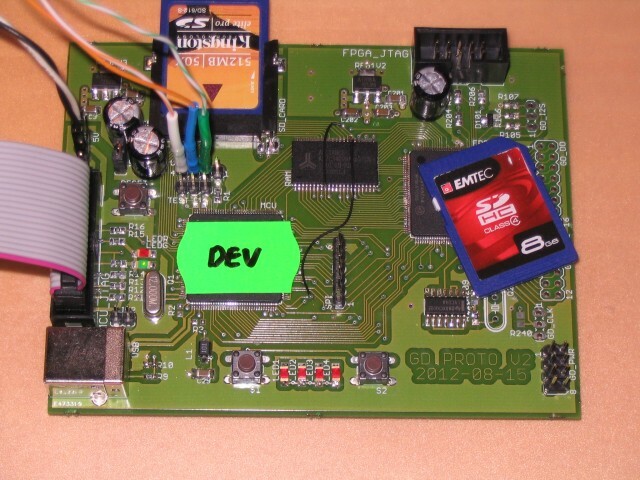 devkitPro is a great dev platform for all Nintendo DS homebrew, and also other consoles that I'm not really that familiar with: GBA, GP32, PSP, GC, Wii. It's a very nice set of free tools and libraries for Windows OS, and we should support it because there aren't really all that many. In fact I'm using it myself - for ARM-related stuff, including GDEMU project. The VMS for NDS was built using devkitPro for example. There is some work being done to have SH4 family support in there as well, so that should also be interesting to Dreamcast homebrew community. Thanks to an article on SemiAccurate I learned about new AMD gadget called, wait for it, Gizmo. You can see it here. - It's a PC (even runs Windows 7 since that's how AMD guys measured the silicon temperatures under stress). First, it needs 3V "button" lithium battery, which is mandatory but apparently not part of the kit. In fact it has to be a battery with wires and a small plug, like in laptops, so forget about buying it in TESCO. Tsk. Then you'll need a SATA hard drive, or SSD, so again forget about cheap SD cards. I suppose a CF card with IDE-to-SATA interface might do the trick if you don't need performance. Lastly it will obviously need more power than a USB phone charger can provide, much more. The good news is it will accept anything from 9 to 24 volts, so it can be run on 12V lead-acid (car) battery for example. So, compared to RPi it's not really that great for small projects. It's on par with some of the Intel N-series Atom ITX boards, like D945GSEJT or DN2800MT. Its form factor places it somewhere between RPi and ITX. - It needs cooling (unless used in a lab environment). While the board is all passive-cooled it's clearly stated in the docs that this is just enough for 25C ambient temperature and only without a case. If you want to put it in a case or use at higher temperatures you'll need to add a fan to the CPU radiator. There is a fan connector on the PCB for that purpose, though I would've like bigger heatsinks. The CPU itself is rated at 6.4W but there's also the companion chip (the "south bridge") to consider. The VRM section is also going to generate some heat but I assume it can deal with it in most situations. Again, a win for RPi and possibly also for the two Atom boards I mentioned since these will work in a case if there is enough convection present. I've seen fanless cases for these Atoms boards so it can be done. Obviously though it depends a lot on where that case will be put :) It might work in an air-conditioned room but not otherwise in summer heat. It's not black and white here. And now we're talking. It's not that much smaller than ITX board and possibly runs hotter so does it have any good sides to it? Yup, the computing power available. It's a dual-core fully out-of-order AMD64 architecture CPU clocked at 1GHz. That might not look very impressive compared to 1.86GHz N2800 Atom, which is also 64-bit capable and dual-core, with Hyper-Threading to boot, but Atoms are in-order architecture. Turns out it's difficult to make code that would not choke in-order CPUs so much. The compilers are to blame although some code (semi-random branching for example) is just not predictable enough to properly optimize. The APU is not just CPU though, it's also the GPU next to it. Radeon HD 6250 in this particular case, with 80 shaders clocked at 280MHz. So why exactly is a measly mobile GPU, the lowest of all AMD has to offer, that much of a win? Because its 80 shaders equal to 1 compute unit (CU), and you can do other stuff with it than just drive VGA output. As you can see it takes some time, and the in-order Atom and RPi ARM are especially bad at it. And my RPi is running overclocked, the typical values are 700MHz for CPU, 250MHz for core and 400MHz for SDRAM so in reality it's even worse. Obviously you don't want to run crackers on your small dev board but what if this was face/shape recognition based on images from small camera on a robot? That does seem like a plausible use case. Yeah, that's whole 6 seconds. Not all code gets that much of a boost on GPU, this one was integer based with some logic operations but didn't have many branches in it. Even the CPU version got twice as fast as simple C code, most likely due to aggresive compiler optimizations - most loops had just 4 passes so it's a great place to unroll and use SSE2 vectorization. With dual-core CPU you can easily run a lot of data processing and offload the really heavy stuff to GPU, so it appears to be a great dev board for more advanced projects. Now why did I bother with this long-winded explanation? Well, it looks like AMD has got all three next-gen consoles in the bag. We've had a lot of "insider leaks" lately, most of it is wishful thinking taken for gospel, especially when it comes to fanboys. Silly people. It's not about raw power anymore. Consoles will not be able to beat PCs with the numbers, not unless you want them to draw 1kW of power and cost the same as rack full of servers. It's about being smart with what limited resources you have. One can argue that's always been the case but this generation will show it even more. A typical PC that can run games in 1080p in 3D at 60fps would need some 300-400 Watts of power. Next gen consoles are promising the same level of fidelity (well, we shall see about that I guess) at half that power. This is what I find most interesting. I couldn't care less if the CPUs are 1.8 or 3.2GHz and how may gigabytes of RAM there are inside. BTW, I've made some additonal calculations. My RPi runs on 5V and draws 0.5A so it used up 5V * 0,5A * 3378s = 8445Ws to get the calculations done. My Radeon 5770 has 108W TDP so let's assume I actually hit that, and that the rest of my PC drew 150W, which is VERY safe assumption as CPU was idle and so were the HDDs. (108W + 150W) * 6s = 1548Ws. So not only it was faster but also used less power :) Nice things, these compute units. With 16 thousands 128-bit wide registers it's no wonder each takes so much silicon space. I might not belive that the world will end this December but two of my PCs decided not to wait and commited suicide. My netbook died first, about a month ago, one day simply didn't turn on and that was it. No amount of messing with its internals would help. It was an old hand-me-down with Atom N270 that I got for free because of failed HDD. I replaced it, reinstalled OS and kept using it for a year or so. It had Win XP, 1024x600 matte screen, 1G of RAM and the battery would hold for about 2 hours - which was good enough for my needs. Hell, it flew with me around Europe a few times. I wasn't using it much at home so I don't need to replace it right away but I sure miss it. Yesterday another N270 gave up the ghost, this time it was my Linux system that I keep running 24/7 for various purposes: router for my private LAN, WiFi AP, FTP/NFS server, and most importantly my dev machine for Dreamcast and NAOMI since I keep my cross-compiler tools there. I liked this board too, it was all-passive cooled and required only 12V input from a brick-type PSU so there were no fans at all. I think the BGA balls cracked because I would get random reboots lately and last week the system would not boot up until it has cooled down to room temperature. Eventually even that stopped working and now it will reboot randomly within 10 seconds of powering up, cold or not. So, right now half of my flat has no Internet and I need to fix that ASAP. There is one more old PC that I have, and obviously my main one that is not very old but it has its years. I swear, one of them dies in the next few weeks and I'm buying a replacement and calling it Apollo 13. In the meantime I started doing more frequent backups. Anyway, so what's up with the GDEMU project. 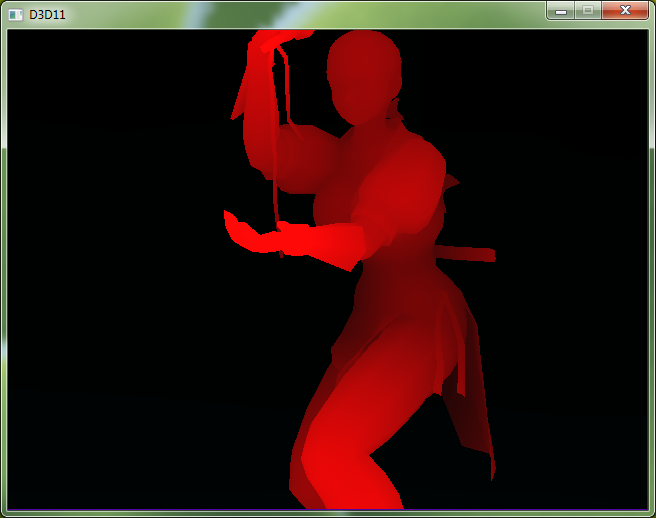 Well, there is progress but I've hit some problems - as usual. I came up with new logic for the FPGA and it works perfectly (so far) between MCU and FPGA but fails on the GD bus. And I have no idea why, I've tried pretty much everything by now, except adding some pull-ups to control lines but I don't expect this to help much. Doesn't look like an electrical problem. The prototype works when FPGA is clocked within a very specific frequency range, but not really otherwise. BIOS loads the game, I get to see the first screen or so and then it dies because DMA goes completly out of sync - I still have tons of data in the buffer but the console expects to see end-of-DMA interrupt already. So obviously I'm missing a lot of read requests but I don't know why. Must be another race condition that I can't figure out. 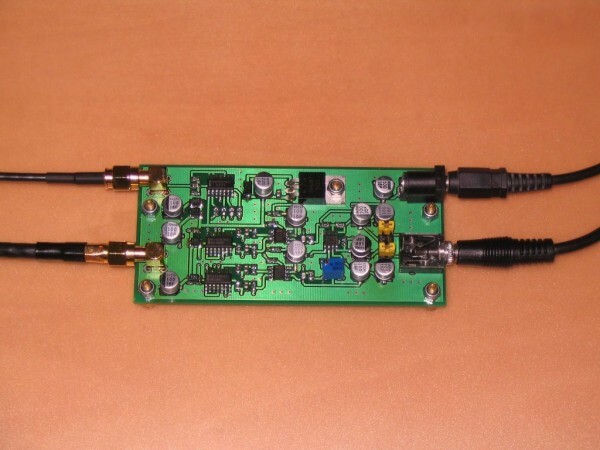 So, why not let it run at the frequency it works? Because the problem is still there, just not as obvious. It's not stable either way and you wouldn't want your game to freeze 3 hours in and who knows how long since last save, right? To combat that I've finally gave in and bought USB based JTAG programmer for Altera FPGAs. Those things are costly but I found a cheap clone that should work nice. I expect it to arrive in a few days. With live JTAG uplink I will be able to transfer new settings directly rather than have to swap SD cards as I do now, and more importantly I'll be able to run a logic analyzer to see what is going on. The world will most likely not end but thanks to all those troubles (and GoG discounts :) my bank account balance just might. EDIT: Looks like it could be electrical issue after all. 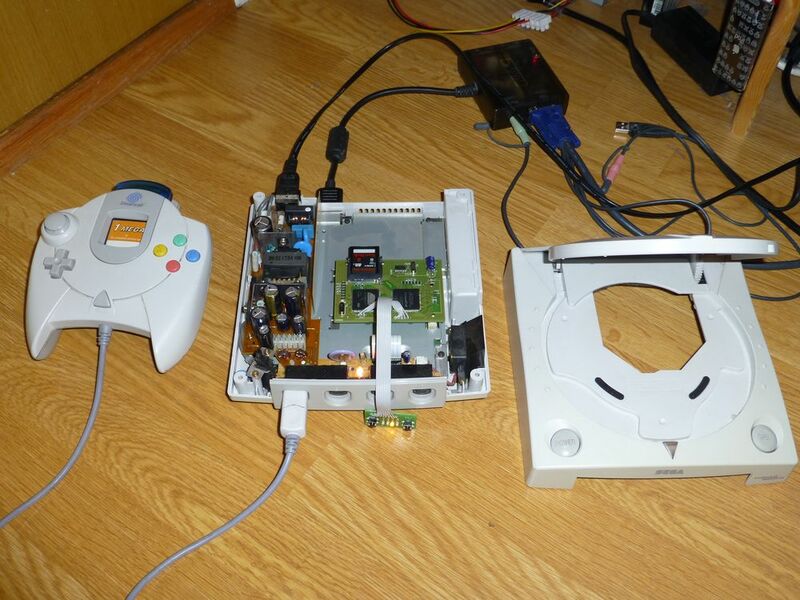 Well, I'm going to rip the Dreamcast apart now and solder some proper wires for ground return path. Lets see what that does. Compile and install the modules and kernel. Reboot. Enjoy. Now, I'm not saying this is the proper way of doing it but 20mA less current draw from PSU (at 12.2V) says it's working. I haven't seen any nasty side effects yet. 3rd-Sep-2012 05:35 pm - Genesis contd. No idea. 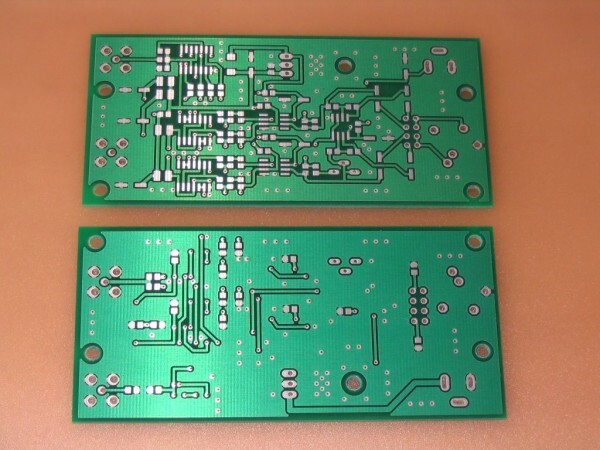 I would not be making a custom PCB and ordering new parts and working on it if I didn't belive it can be done, but at the same time I cannot (and will not) make any promises about delivery dates. Obviously though if I can't make it work as I'd like in the next few months it's going to be shelved again. Again, no idea. In fact it's not even decided I will be selling those. If it doesn't seem like I can turn a profit without investing all my free time into it, I'll just stop at prototype phase. While I understand that it would upset many of you, I'm not a charity worker. It's one thing to code a free application and share it with the world and quite another manufacturing a hardware device for sale. 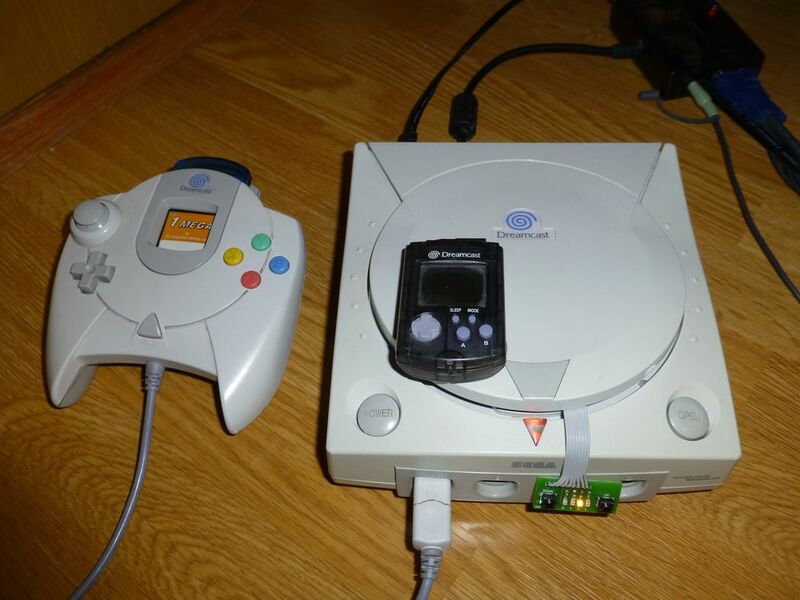 All I can say right now is the prototype is pretty expensive (compared to a price of a working, pre-owned Dreamcast). But that is true for all prototypes. Things get considerably cheaper when mass-produced. Then again it's quite possible the first batches will still be priced higher because of low volume of sales - I'm sure as hell not going to invest my own money into this. While Kickstarter seems like a good option, it's a no-no because I'm not a US resident. End of story right there. I will also not take any kind of preorders (or other money offers) until I'm certain the device will work and can be manufactured in suitable quantities. Things get serious when money are involved and I'm a rather cautious person. 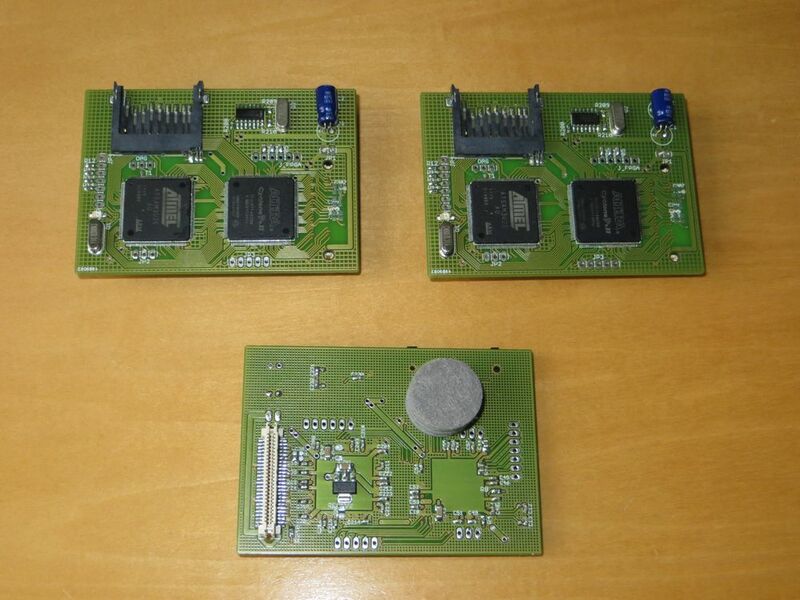 It will be a 100% compatible replacement for GD-ROM drive, except using SD cards. It might offer better loading times but otherwise will function in the same way. It's meant to provide a backup solution for the laser and other mechanical parts of the drive which are no longer in production and fail after so many years of use. While many of you will interpret this last sentence as "it will play game rips" I'd like to point out that I never condoned software piracy. I think I made my point clear when I refused to fix any bugs in Makaron that were related to CDI rips of the games (as opposed to proper GDI images). Many of these "bugs" were actually how the rips worked on a real console, although these could be somewhat helped if I wanted to. But I didn't. So, if you are/were a Dreamcast user then you should be familiar with region locks, video cable restrictions, bootable (or not) homebrew, etc. Using GD-EMU will not remove/help with any of these. 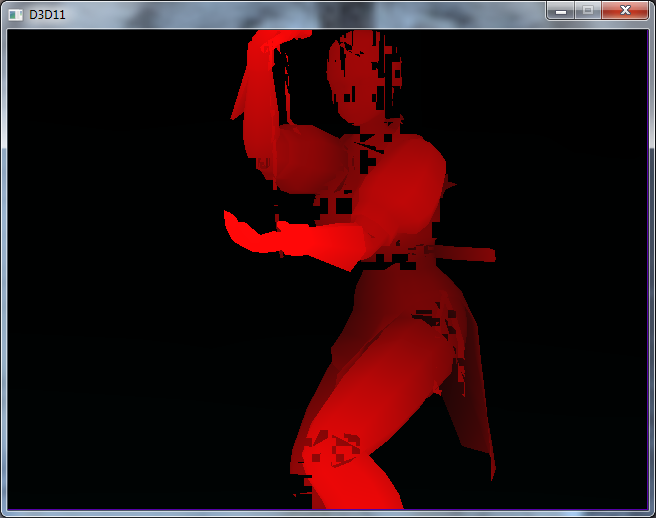 You might try image patching, sure, but I will not give any support for these modifications if there are any problems. As for user interface - I like simple things that work as expected. I've seen too many projects that looked nice but didn't deliver what was promised in the first place. My goals are perfect compatibility and stability. Anything else is extra. I think 2 buttons is enough to select which game on the card should be "inserted". 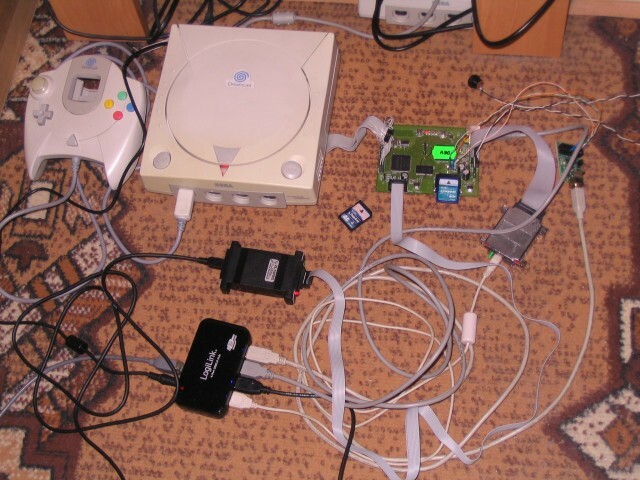 If that's not enough for you, code a good Dreamcast app that will select games from the card - it can be put as the first image on it, which will boot by default. Then we can talk about how to make the hardware do what the app/user wants. 5) USB link to PC? That's in plans, but no work has been done yet. I'm not even sure the USB port on the prototype works properly :) So, eventually yes, but probably not from the start. USB host support (as in USB HDDs and FLASH drives) is probably not going to happen. Did I mention I like simple solutions? 8) Pics or it didn't happen. There are photos of my all-FPGA approach on this blog, and even some short movies on YT of it working (with minor issues) if you know where to look. I will post pictures of the V2 prototype connected once it actually does work. I'm redoing much of my FPGA code and this might take some time as I want to try another approach. EDIT: Turns out the R3 answer is the only one not protected by CRC7, that space is marked as reserved and just filled with all-ones. I'm still not getting the busy bit within reasonable times on these Kingstons but I suppose reading the docs few more times might teach me something new again. Now it's a proper prototype, with all these wires and blinking LEDs. 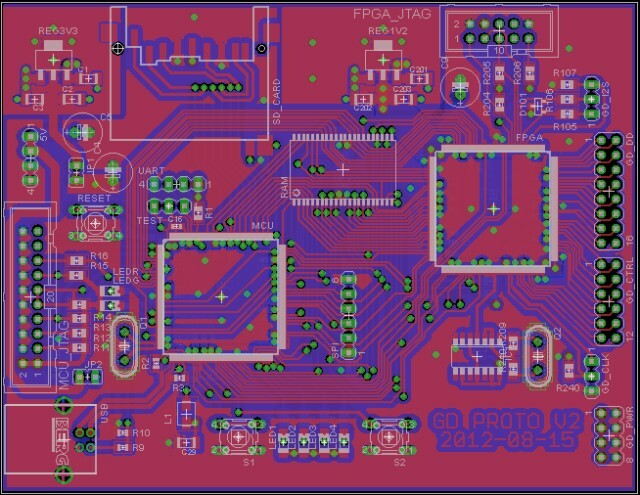 A few things are still missing on the PCB but right now I need to get SD protocol working so I can fetch FPGA configuration image and test it. I'm using my own FAT library, which has no write support but it was designed to be fast while consuming as little RAM as possible. In fact current SD cards are so fast it makes sector buffering impractical, since the lookups and LRU queues kill any gains with additional overhead. I suppose it'd be different if the CPU was clocked above some 400MHz and had some fast L1 cache. Right now I get average of ~10MB/s in test that seeks to random part of 1.2GB file and reads 1-3500 consecutive 2352-byte long chunks. 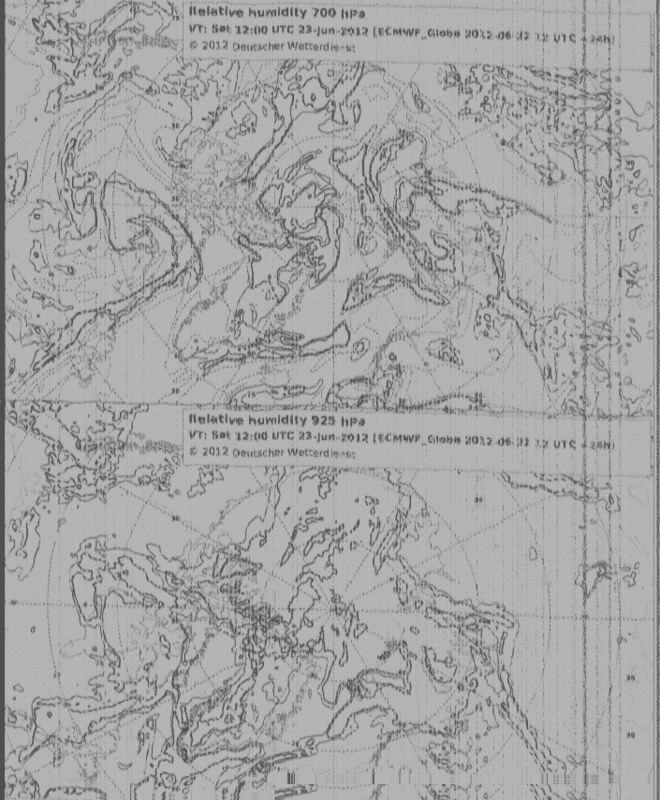 This is to simulate RAW image reads for GD-ROM. 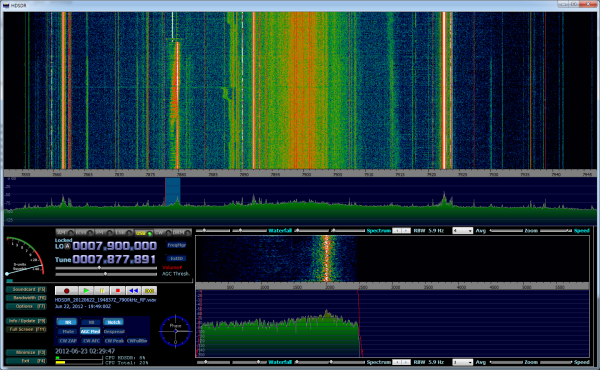 So pretty well I'd say, a nice boost compared to 2.5MB/s I got over SPI. The native SD interface required a pretty much complete rewrite of some code, so I'm not 100% sure it's stable and all, but seems to work for hours without problems so far. This page was loaded Apr 20th 2019, 2:46 am GMT.